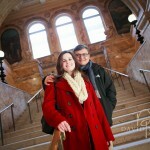 It was an absolute delight celebrating Stefanie and PV’s engagement with a pre-wedding stroll through the Boston Public Library, Copley Square, the Copley Fairmont Hotel, and the beautiful Commonwealth Ave. Mall. I’m truly looking forward to their upcoming wedding this spring. Enjoy the photos! !